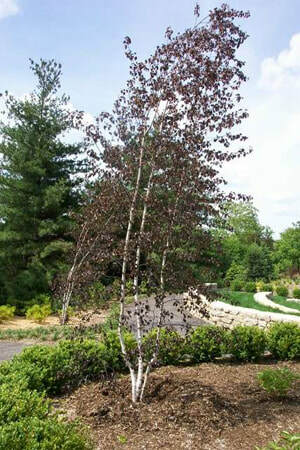 A purple leaf form of the popular and very elegant Betula pendula (Silver Birch). Slightly slower growing than the species, 'Purpurea' matures into an attractive upright habit. An excellent choice for gardens as it grows well on a wide range of soils. Also of interest to tree collectors with dreams of their very own arboretums due to it being one of the rarer cultivars. Similar to silver birch in that it gives dappled shade providing a light and airy feel to the garden. Excellent for underplanting with a range of shrubs that will receive plenty of light and contrast well against the purple foliage and white trunk.